The free GODAN e-learning course on Open Data and Research Data Management in Agriculture and Nutrition - started on 13 November 2017 - is at the end of its second week. 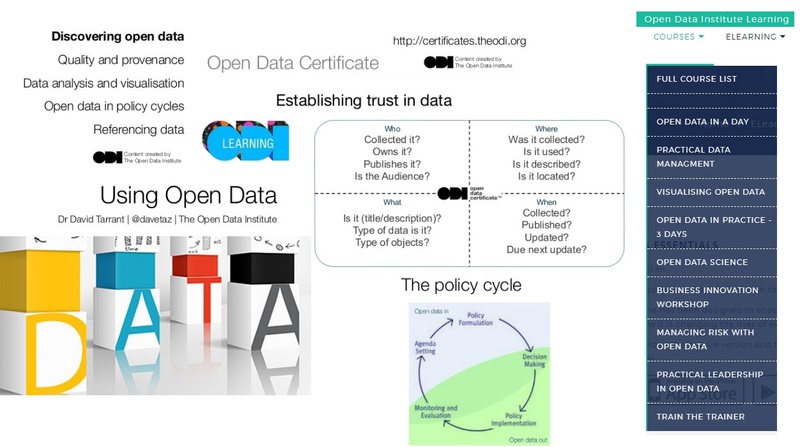 The second course Webinar introduced the Open Data Institute (ODI) with focus on Using Open Data. The session also visited some elements (Who? Where? What? When?) necessary to establish Trust in Data, presented several free power tools for cleaning data, and showed how Open Data helps every stage of the Policy Cycle. David Tarrant has applied his data science skills to build policy making tools for Open Data leaders, including the Open Data Barometer visualisation which has been used to guide policy development and allow leaders to compare and contrast their Open Data initiatives with other similar initiatives globally. As Learning Skills Lead, David Tarrant is responsible for the direction and quality of the ODI's learning offering which includes face to face training, eLearning and the ODI's Learning Records System (LRS).